Good Morning! Today is my post over at the Jaded Blossom Blog. Spring is Here (or will be someday). Here is my adorable Strawberry Basket! I found these chocolate strawberry candies and knew they would be a fun treat. 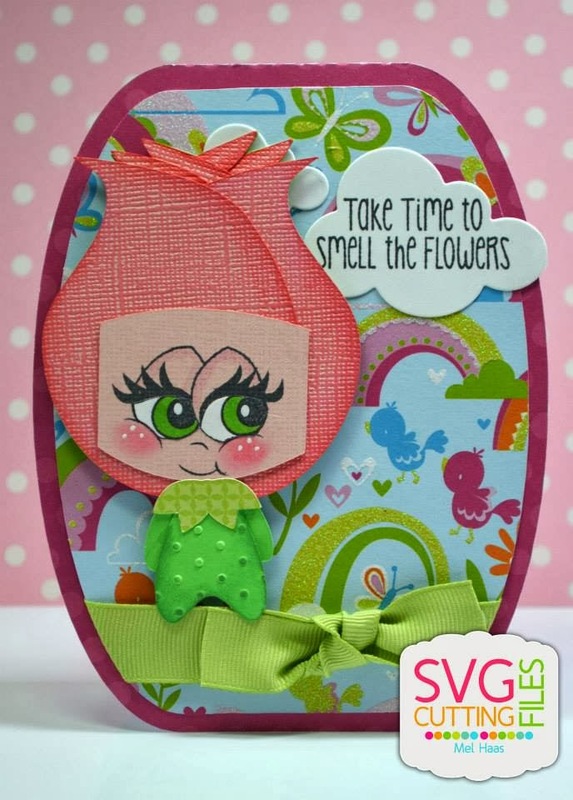 I filled a basket that I found at the Silhouette Store with strawberry candies and just tucked in the Strawberry Chibi from SVG Cutting Files. Blossoms are added to her and the basket with the Spring Die. I stamped "Spring is Here" on the Mini Tag Die. The eye of the tag was just cut on the side so I could attach to the strawberry top. "You're Sweet" is stamped on the banner from the Mini Tag Die set. Here is a close up of this cutie! Her face is from Peachy Keen Stamps, PK-1370. Hello, How you Bean? Welcome to Candace's Birthday Blog Hop! Today we are celebrating our dear friend Candace's birthday! A "doggie bag" for Candace. Her favorite Jr. Mint candies are tucked inside the bag. Hello! Today is my post over at Digi My World. 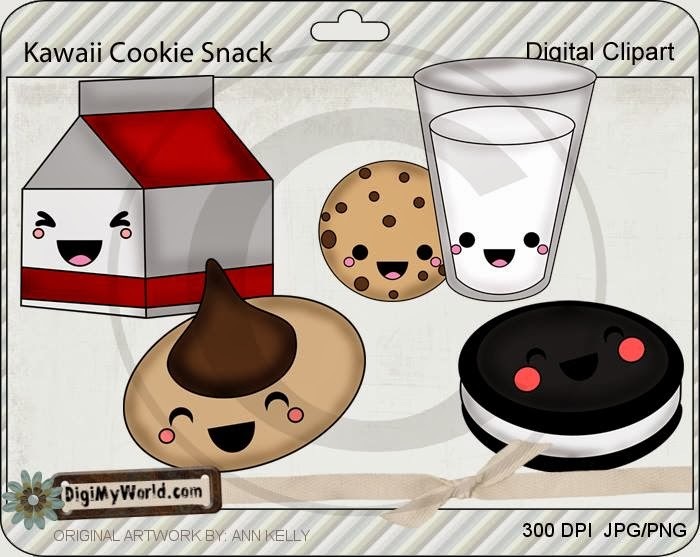 This week, The Kawaii Cookie Snack will be at the Digi My World Store. The cutest cookies are in the set.. cookies with Zero Calories. he he. I colored the milk container from the Digi Stamp Set. He is colored with Spectrum Noir Markers. Here is the clip art of these cuties! Here is a fun card featuring Thing 2. Thing 2 is on the Wave Card Base from SVG Cutting Files. Be sure to join the SVG Cutting Files Galleria, HERE. Have a smashing good weekend! Hello! Today is I am posting over at the SVG Cutting Files' blog. New Files will be available this Friday. The adorable gardener is "Gardening Becky". Isn't she adorable! To make this card, I used the Wavey Card Base. The Cloud cut is from the Rainbow Stitch Up. 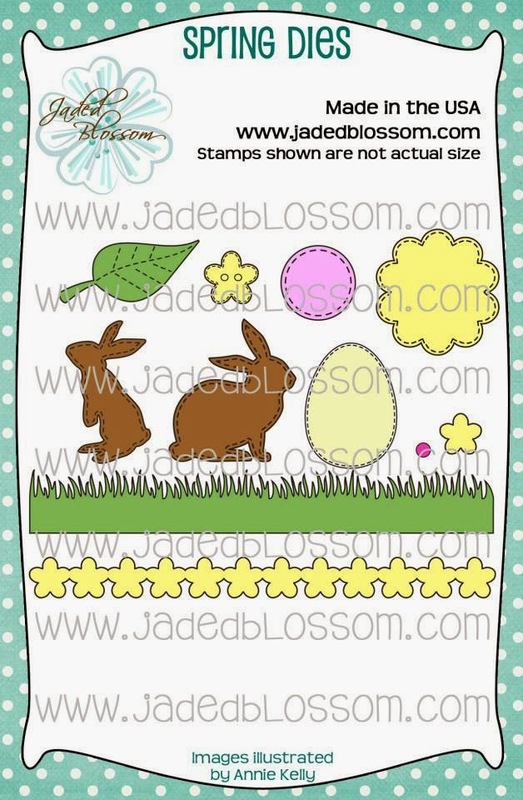 The grass and flowers are from Jaded Blossom's Spring Dies. Hello Eveyone! SVG Cutting Files' Challenge time! This month, the theme is "spring". Here is what I came up with- I would take time to smell the flowers as cute as this one! The winner will receive a gift certificate for the SVG Cutting Files store... be sure to link HERE up by March 14. Hi Everyone! 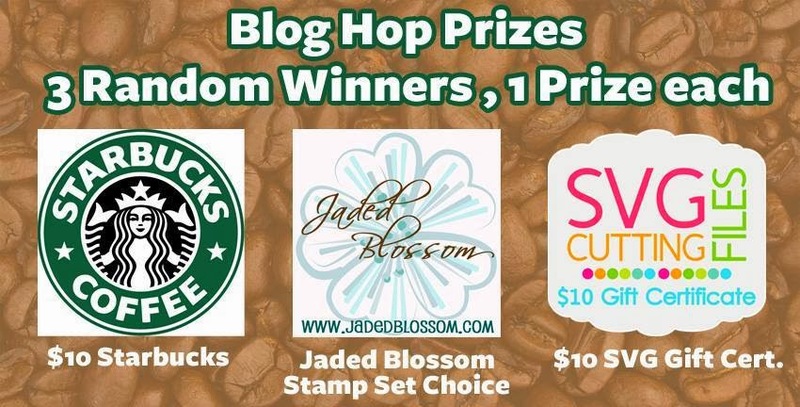 Welcome to Jaded Blossom's February 2014 Release Blog Hop. Now if you're here from Kate you're in the right place, if you're just passing thru start at the beginning because you don't wanna miss anything. I also have the complete line up at the bottom. 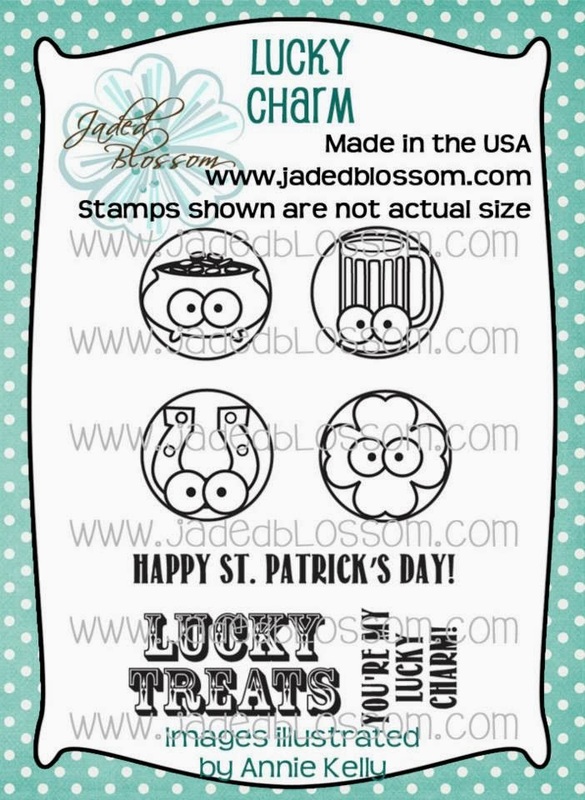 And how cute is this shamrock die? Love the loop on the side, perfect for a lucky charm! Hi Everyone, It's Release Day over at Jaded Blossom! We hope you all enjoyed our projects this week. 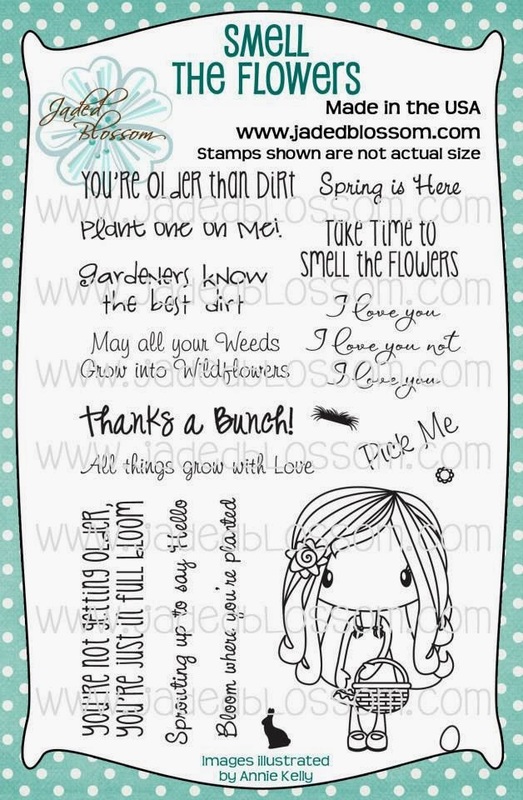 But as you know we have one more Stamp Set and our February Freebie. Free Stamp for customers that spend $40 or more before Taxes and Shipping! FREEBIE is only available for orders after 4 pm today until Sunday 2/16, 11:59pm PST. Here is what I made for today, a tag for a carrot container. I love the adorable bunny from the Spring Dies. My backyard is full of bunnies (my neighbors seem to think they are pests.. but I like watching them play in the yard). I added some cotton for his tail. One of the Spring Treat Tags is used with the Treat Tag Die . See you Later at 4pm, PST for our Stamp Release Blog Hop! You won't wanna miss it. Last but not least don't forget to join our Crafter's Choice Challenge this month, more about the challenge HERE. Hello Everyone! 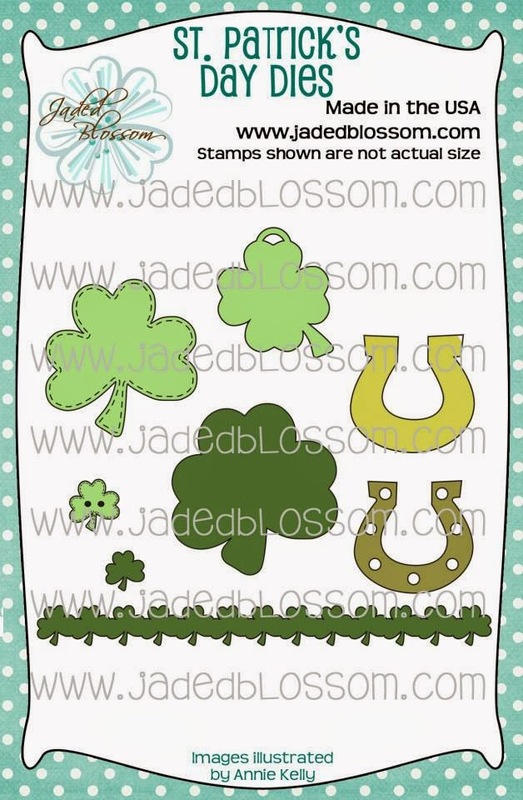 Welcome to Day 4 of Jaded Blossom's February Release. We have two sets today, Smell the Flowers and Poppies. For my project today, I used the Smell the Flowers set. I colored the girl with the basket with Spectrum Noir Markers. Included in the set are "goodies" you can put in her basket. I picked the flowers and grass. This flower box is NEW at SVG Cutting Files. Flower Center Box. Thanks so much for stopping by today.. be sure to see the Jaded Blossom Blog today. There are some beautiful projects made with both of these sets. Welcome to Day 3 of Jaded Blossom's February Release! Today we have Spring Bingo and Spring Wraps to preview. Look at these cuties all decorated with Jaded Blossom! SVG Cutting Files created these new Spring Nugget Holders and are available today. Yay! The candies are decorated with Spring Bingo, Spring Wraps, and Easter Wraps. The bands are made with the Candy Wrap Dies. 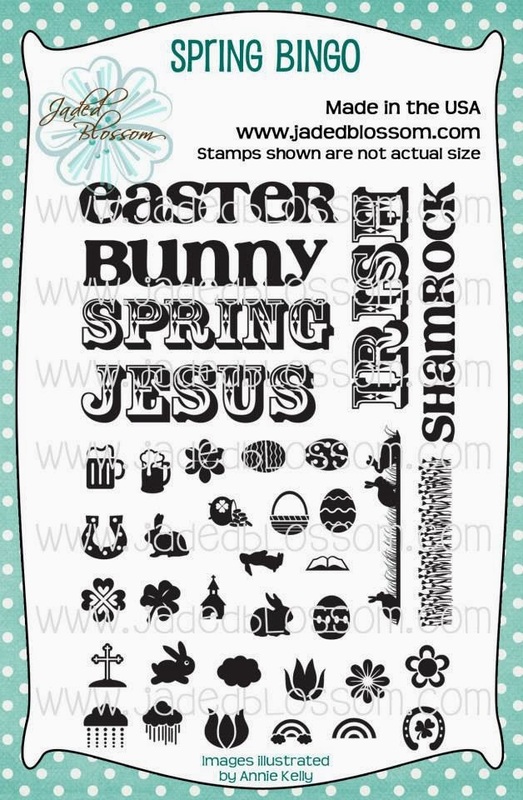 Miss Chickie has eggs from Spring Bingo, Sentiment and Flower Stamp Wraps are from Spring Wraps. The Mini Tag Dies fits "happy spring" perfectly. Rabbit has "chocolate" rabbits from Spring Bingo. 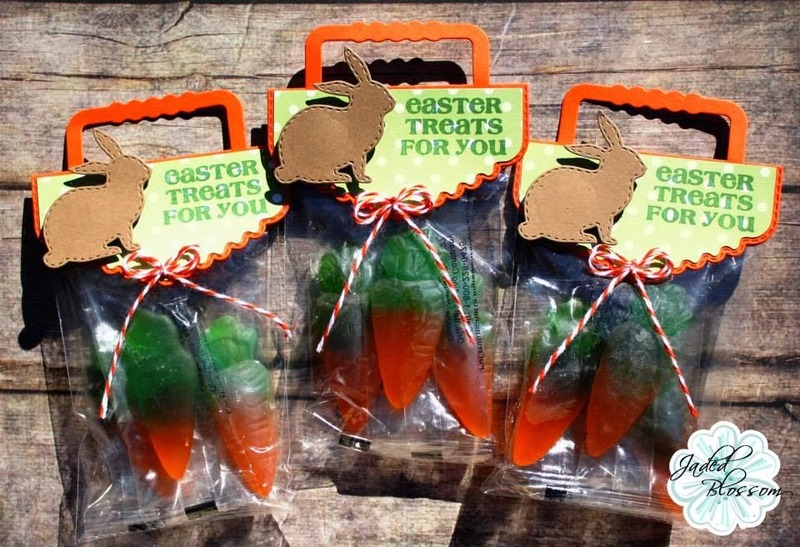 The bunny heads on the wrap are from Easter Wraps Stamps. 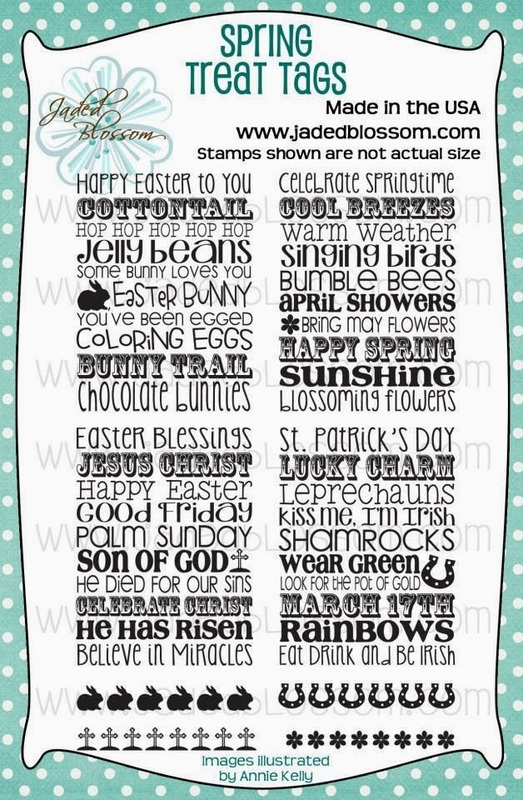 The sentiment on the side is created with Candy Wrap Dies and a Sentiment from Easter Bingo. And tonight is the last chance to pick up the "got to have it" bundle with the special savings. February Release will include: 6 - 4 x 6 Stamp Sets 1 - 4 x 4 Stamp Sets 1 - 3 x 4 Stamp Sets 2 - Set of New Dies 1 - Free 2 x 3 Stamp for customers that spend $40 or more before Taxes and Shipping! FREEBIE is only available until Sunday 2/16, 11:59pm pst. NO PREORDERS! NO BACKORDERS! No waiting WEEKS for your stamps. WILL SHIP ASAP!!! This Package is only available till Wednesday 11:59pm pst, then will be back up on the store on Friday at 4pm pst during our Stamp Release Blog Hop! Price for the Release Package will be $149.99 after Sunday Night, 2/16 11:59pm, pst Regular Price 159.00 That is a $20.00 savings so you better take advantage of our special price. 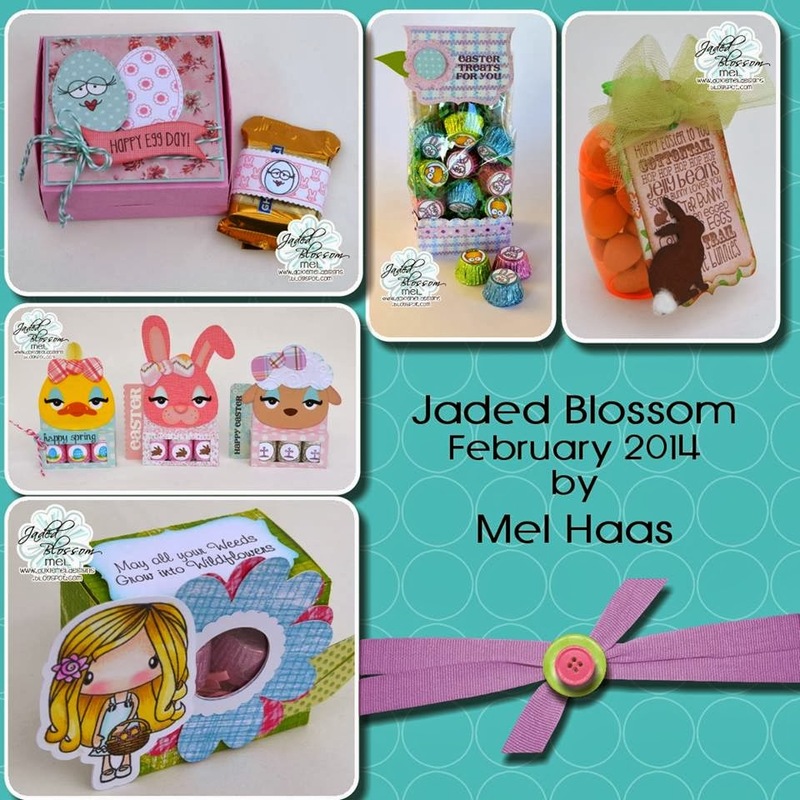 Hop on over to Jaded Blossom to see more projects. Have a great day! 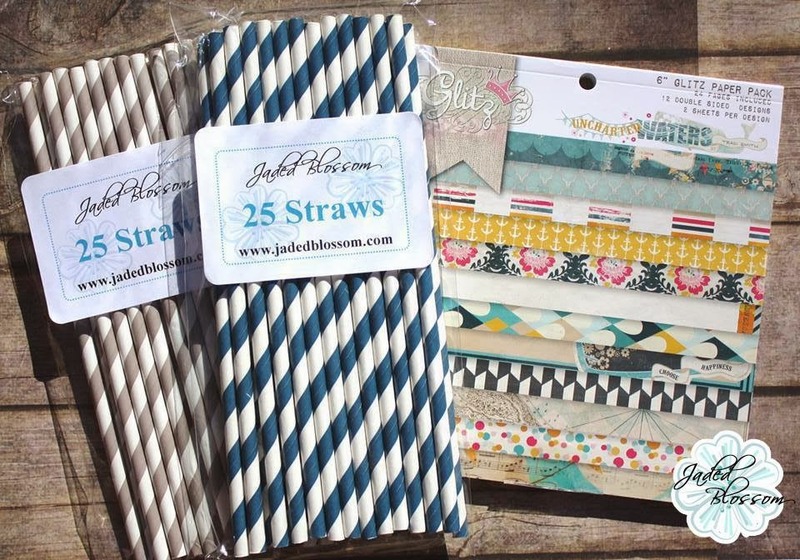 Welcome to Day Two of Jaded Blossom's February Release. 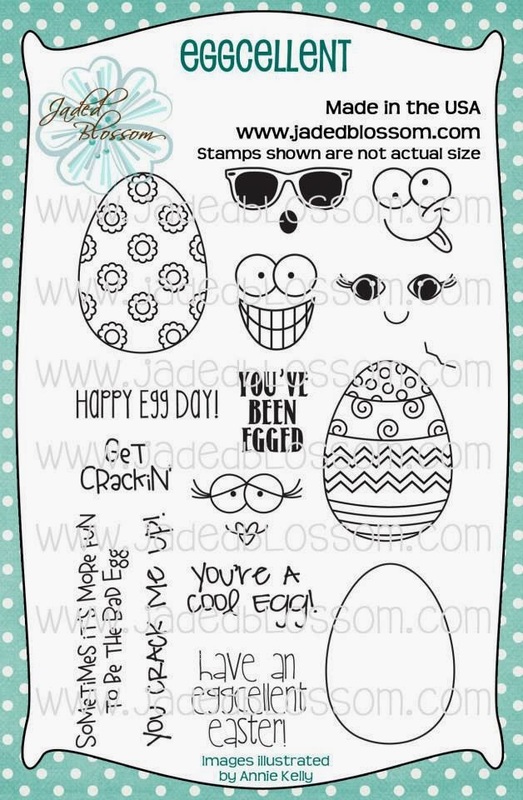 Today the design team is creating with the "Eggcellent" stamp set. with the eggs and sentiment from "Eggcellent". So many possibilities to decorate your own eggs with this set AND the egg die from Spring Dies fits the egg stamp perfectly. Yay! I made wraps for the candy with Flag Die 2. 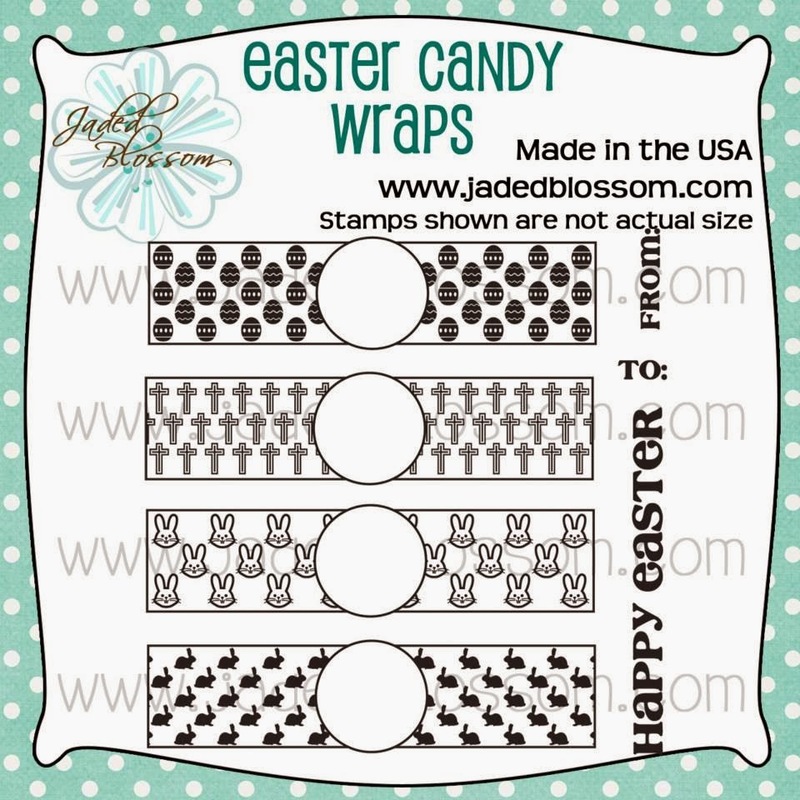 The wraps are stamped with Easter Candy Wrap stamps. The egg in the center of the wrap.. she is from Easter Treats 3 and her heart shaped lips are too cute! 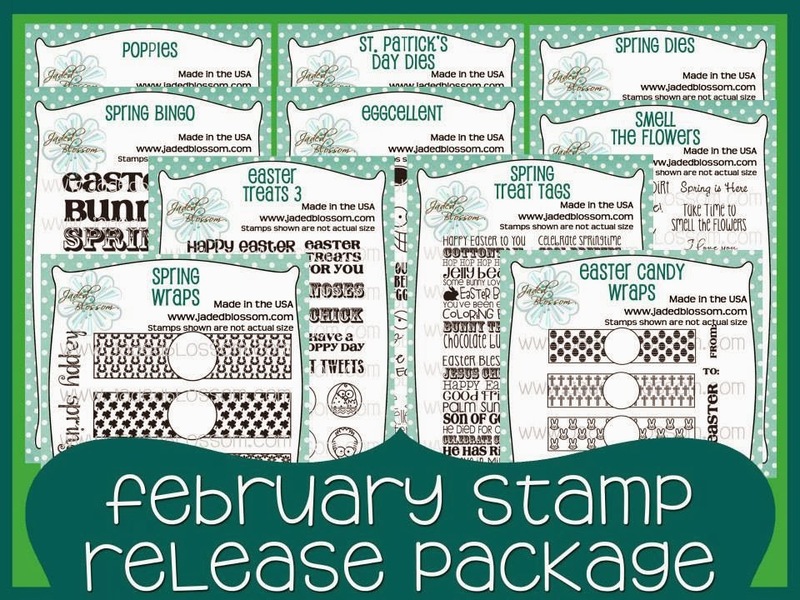 The Easter Candy Wraps, Easter Treats 3, and the Spring Dies are from Monday's Preview. The sentiment is on a banner from Mini Tag Dies. Hello Everyone! Today is my Design Team day over at Digi My World. I have a 5 x 5 card featuring one of the cute Bunny Suit girls, this one is Eloise. She is one in a collection of several.. hard to pick which one to color as they are so adorable. Good Morning! 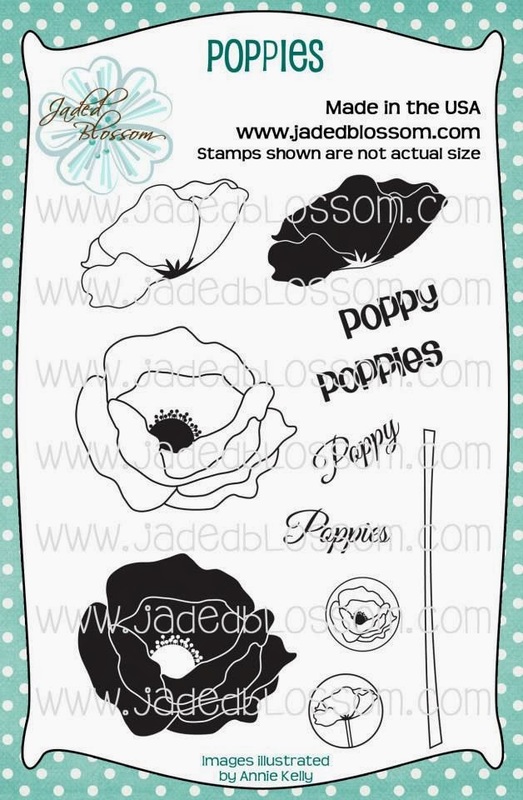 Welcome to day one of Jaded Blossom's February Stamp Release. 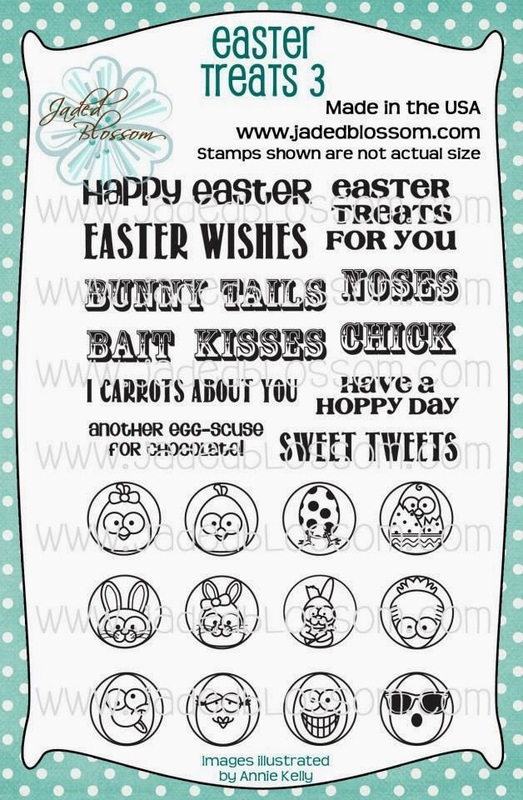 Here is the close up of the candy- These sweet Easter icons are included in Easter Treats 3. They are colored with Spectrum Noir Markers. Some sparkle was added to the center of the flowers with Queen and Company's Rhinestone Trios, Girl. I just love these dies! Head on over to the Jaded Blossom Blog to see what the rest of the team has created. Good Morning- I just wanted to share a Valentine treat I made. I used lots of products from Jaded Blossom and colored an image form Digi My World, Lil Cupid Boy. I stamped on the heart "Love" from one of the icons form Valentine Bingo and then added some white gel pen behind the letter. The image was colored with Spectrum Noir Markers. Well that is it for me today.. going to head over to Disneyland. Yay!